-Read the media bias example below (from a May 9 post by Matt Hadro at mrc.org). Benghazi terrorist attack September 11, 2012. Last Wednesday evening, CNN barely covered the congressional hearing on the Benghazi attack from earlier that afternoon. Instead, the network provided wall-to-wall coverage of the Jodi Arias murder trial verdict and the Cleveland kidnappings. From the hours of 5-11 p.m., CNN gave…4 hours, 9 minutes of coverage to the two crime stories, but only…eight minutes to Benghazi — over 30 times more coverage. And three of CNN’s prime-time shows didn’t even mention Benghazi. The 8 p.m. and 10 p.m. hours of Anderson Cooper 360 featured over one hour and twenty minutes of material on Arias and the Cleveland abduction, but not one second on the hearing. The 9 p.m. hour of Piers Morgan Live aired over 40 minutes on the two stories [the woman who murdered her boyfriend, and the women who were rescued in Cleveland], but completely ignored the Benghazi hearing. Unfortunately, Blitzer’s colleagues didn’t get the memo about this “very important” hearing. Most of the prime time Benghazi coverage clustered at the end of Blitzer’s 6 p.m. hour of The Situation Room, in a 7 minute, 13 second-long story. Host Erin Burnett only spent 39 seconds on the hearing in a news brief during the 7 p.m. hour. That was all the coverage from 5 p.m. to 11 p.m.
1. What two types of bias does the excerpt below highlight? Why do you think the news media chose to give viewers tabloid news (what according to CNN’s Burnett was a “soap opera” full of “salacious entertainment”) instead of reports on an important government investigation of a terrorist attack on a U.S. embassy? Explain your answer. In the case of Benghazi, do you think the media met these standards for reporting? Explain your answer. WHY IS CONGRESS HOLDING HEARINGS ON THE ATTACKS ON THE U.S. CONSULATE IN BENGHAZI, LIBYA IN WHICH 4 AMERICANS WERE MURDERED? 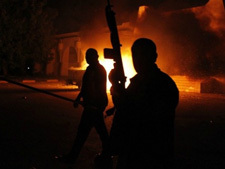 The American diplomatic mission at Benghazi, in Libya, was attacked on September 11, 2012 by a heavily armed group. The attack began during the night at a compound that is meant to protect the consulate building. A second assault in the early morning the next day targeted a nearby CIA annex in a different diplomatic compound. Four Americans were killed, including U.S. Ambassador J. Christopher Stevens. Secretary of State Hillary Clinton, U.S. Ambassador Susan Rice and President Obama blamed the attacks on a Muslim protest turned violent over a youtube video that supposedly insulted Islam’s prophet Mohammed. It is now believed that the Obama administration knew the attack in Benghazi was a coordinated terrorist attack from the beginning. The Obama administration’s responses to the attack are being questioned, with suggestions that if they had acted correctly, the attack could have been prevented or at least some of the Americans could have been rescued.